Society Socks is a men’s monthly sock subscription with a social cause. With every pair of socks sold, another pair is donated to charity. Society Socks designs new and unique socks every month to provide its subscribers with new and exclusive socks on a monthly basis. In this interview, Filip Pejic, co-founder of Society Socks will recall his experience with Feedier, and how he is able to increase his customer satisfaction survey response rate by 200% in such a short notice, using Feedier. Filip explains that he was looking for a feedback software in order to measure the customer satisfaction, and lucky him, Feedier appeared at the right time. We were looking for a way to get to know our customers and ask them questions on their thoughts about our socks. Eventually measuring our customer satisfaction. Finding such feedback survey tool was only part of the requirement, the most important thing for him was the user experience offered to the end user. Feedier had very appealing visuals, an easy setup process and integrated well into our email system. A lot of the other survey software offerings had very poor visual experiences or poor functionality, while Feedier had the best of both worlds. After making a sample campaign, I was sold. Later in the interview, Filip recalls the “AHA” moment that stroke him when he started using the product, and the availability and willingness to help from our support team. I had a very strong first impression due to the ease of use and well thought out flows on the site. After reaching out to customer service to ask about a service, I received very helpful feedback quickly. I instantly knew the Feedier team not only valued creating a great experience, but also wanted to ensure they were listening to their users! One of the key factor leading to retention is the user onboarding, how you can make his first steps with the software as smooth and easy as possible. This was demonstrated and discussed in this article from Walkme. Luckily, this is part of our focus at Feedier, and Filip is very satisfied. Onboarding was extremely quick and effortless. I needed little to no guidance when it came to using the software and was able to quickly shift from figuring out how to use the website to focusing on how I would structure my campaign ideas. How Does Society Socks Use Feedier Today? Filip details the way he uses Feedier to get a better understanding of his audience. His main challenge relies on getting a grasp on why his customers buy on his website and what motivate them. This is a way for Society Socks to segment out their customer base, and define proper customer groups based on demographics data, but also based on their motivation. This latter segmentation criteria could have been figured without such feedback campaign. What do their customers like about their products? What can be improved on their store? On a final note, Filip added that he will likely expand the scope of his feedback programs.. I decided to begin by targeting past customers. Moving forward, I will likely structure more campaigns targeted at my newsletter subscribers and social media followers. Societe Socks currently uses Klaviyo to automate email flows. In order to automate the feedback request, and put it in front of the customers when that makes sense, they have setup of asking which has enabled us to very easily set up a custom survey environment. Our current campaigns are set up at various stages including Post-Purchase, Mid Subscription and at Cancellation. We’ve integrated the solution into our email system to send automated flows depending on our customers’ stage in the buying process. This allows us to gain a ton of feedback at every point in a customer’s journey and control the number of surveys they receive. 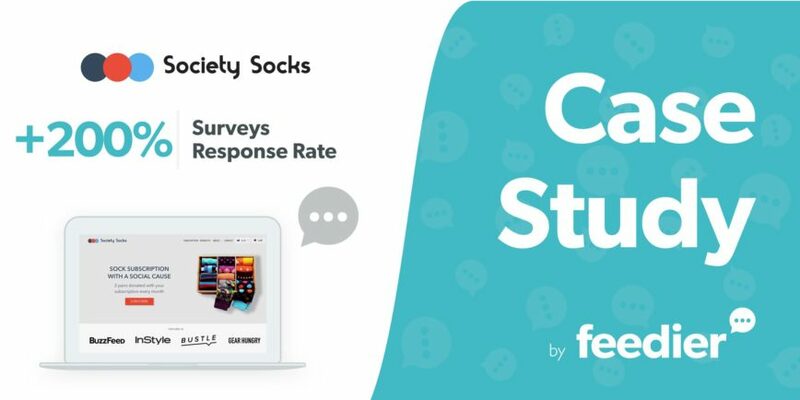 As mentioned before, Society Socks is able to increase its survey response rate by 200% by using Feedier. They have been able to achieve such great results by focusing on the design of their survey, and making it completely relevant, as stated in our customer feedback guide. This is only a starter, and this will be later improved and fine-tuned by using the reward feature, where they’ll be able to even further boost their response rate. This would also be a way to push the loyalty in case of any voucher incentive. By increasing customer retention rates by a mere 5%, a business is able to increase profits anywhere from 25% to 95% (Bain & Company). Which lead us to the importance of understanding the customers and being able to serve them the way they want to be served. This is particularly true in the e-commerce world, where we see websites popping up the ground every minutes. Understanding what drove the customer towards being on the website, and why did he pick this very particular website. This understanding is possible through post-order customer satisfaction survey. What Does the Data Received Look Like? With my first couple of campaigns (which are still running), I was able to pull out some very interesting details about my customers which I would have never known of otherwise. After receiving a substantial number of emails, I was able to start identifying trends such as customer demographics, customer preferences, and more. Filips then explains that he is not going to stop there, and plan to use it for additional use-cases. I plan on using this information to make changes to my landing pages, checkout flows, advertising campaigns and much more. The value of the feedback is truly priceless. 👉 If you want to understand your audience and increase your survey response rate like Filip does, Start For Free Now. Customer Feedback Loop, Why and How?